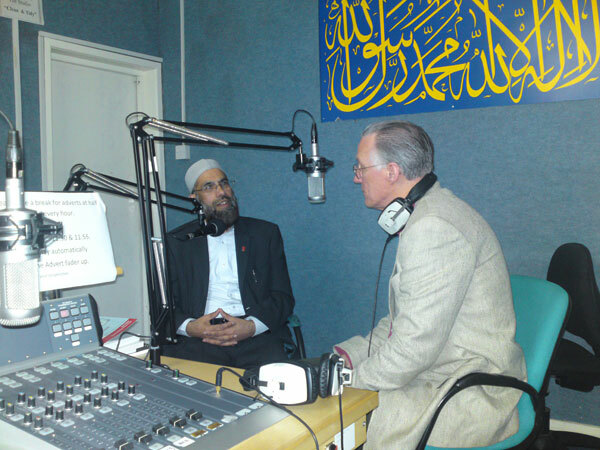 Dr. Musharraf Hussain O.B.E., founder of the Karimia Institute, president of the the UK's Christian-Muslim Forum and Trustee of the National Centre for Citizenship talks with Giraffe's John Graham about the launch later this year of Giraffes/UK. They're shown here in the studio of Dawn Radio, Karimia's broadcasting facility in Nottingham, England. Giraffes/UK will honor heroes there, regardless of their ethnicities or religious affiliations and will aim at narrowing the dangerous gap between Muslims and non-Muslims throughout the UK.